Classic Bollywood movie poster of the Hindi film Raju Ban Gaya Gentleman (1992) for sale. 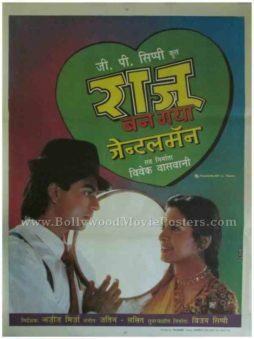 This is an actual surviving classic Bollywood film poster of the 1992 Hindi movie that featured the “King of Bollywood,” superstar Shahrukh Khan opposite Juhi Chawla. Raju Ban Gaya Gentleman is one of the early successful films of the Bollywood Baadshah's career and the first of his many collaborations with actress Juhi Chawla, making this Shahrukh Khan poster highly collectible! Printed and circulated during the original release of the film (somewhere in the early 1990s), this Shahrukh Khan poster was originally designed for publicity of the film but never ended up being used. The film is remembered for its catchy soundtrack, mainly for the songs “Laveria Hua” and the tile track “Raju Ban Gaya Gentleman,” which are fondly remembered and played till today. Old Bollywood movie poster of the blockbuster Hindi film Parinda (1989) for sale. Featured here for sale is an old Bollywood movie poster of the 1989 cult Hindi film that starred critically acclaimed actor Nana Patekar in a negative role along with stars such as Anil Kapoor (of Slumdog Millionaire fame), Jackie Shroff and Madhuri Dixit. Parinda was a blockbuster and has attained cult status over the years. The film is considered to be a turning point in Indian cinema. Parinda won two National Film awards and five Filmfare awards. The film's portrayal of the stark reality of crime and the underworld was appreciated by masses and critics alike. 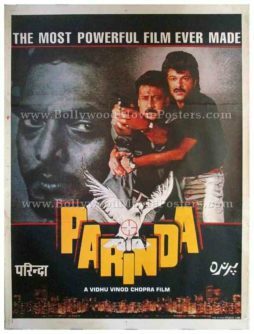 Parinda was India's official entry for the 1990 Academy Award for Best Foreign Language Film, making this poster highly collectible! Printed and circulated a few years after the first release of the film (early 1990s), this old Bollywood movie poster was originally designed for publicity of the film but never ended up being used. This rare Parinda movie poster features a large close up photograph of the antagonist Nana Patekar on the left. Another still photo featuring actors Jackie Shroff and Anil Kapoor appears alongside. The logo of the film shows a white dove marked with the crosshair of a gun. Parinda is a 1989 Indian crime drama produced and directed by Vidhu Vinod Chopra. The film stars Jackie Shroff, Anil Kapoor, Nana Patekar and Madhuri Dixit in the lead roles. Soundtrack for the film was composed by master music composer, Rahul Dev Burman. 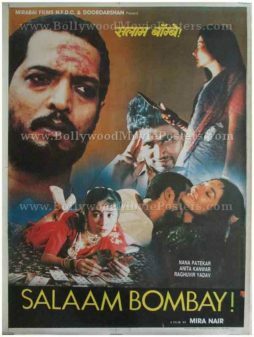 Old Bollywood poster of the award winning cult film, Salaam Bombay! (1988) for sale. This is an actual surviving original publicity poster of the 1988 film directed by Mira Nair that showcased the hard hitting reality of homeless children living on the streets of Mumbai. Salaam Bombay! won the National Film Award for Best Feature Film in Hindi, the National Board of Review Award for Top Foreign Film, the Golden Camera and Audience Awards at the Cannes Film Festival, and three awards at the Montréal World Film Festival, making this poster, highly collectible! Printed and circulated somewhere during the early release of the film (Late 1980s / Early 1990s), this old Bollywood movie poster was originally designed for publicity of the film but never ended up being used. This photographic Bollywood poster features a large close up photograph of Nana Patekar on the left. The young prostitute who is forced into the flesh trade, “Sola Saal (Sixteen year old)” is seen at the bottom of this old Bollywood poster. Most of the young actors who appeared in Salaam Bombay! were actual street children. To prepare them for the film, they received special training in drama at a workshop in Bombay. Salaam Bombay! was nominated for the Academy Award for Best Foreign Language Film and finds mention in the list of “The Best 1,000 Movies Ever Made” compiled by the New York Times.